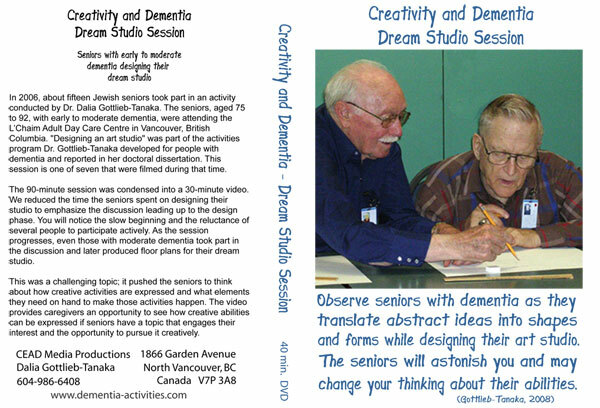 Creativity and Dementia "Dream Studio Session"
40 minute DVD .... 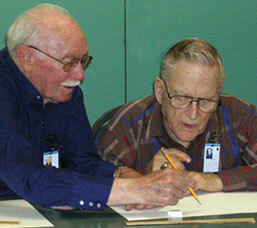 Observe seniors with Dementia as they translate abstract ideas into shapes and forms while designing their art studio. The seniors will astonish you and may change your thinking about their abilities (Gottlieb-Tanaka, 2008). In 2006, about fifteen Jewish seniors took part in an activity conducted by Dr. Dalia Gottlieb-Tanaka. The seniors, aged 75 To 92, with early to moderate dementia, were attending the L’Chaim Adult Day Care Centre in Vancouver, British Columbia. "Designing an art studio" was part of the activities program Dr. Gottlieb-Tanaka developed for people with dementia and reported in her doctoral dissertation. This session is one of seven that were filmed during that time. The 90-minute session was condensed into a 30-minute video. We reduced the time the seniors spent on designing their studio to emphasize the discussion leading up to the design phase. You will notice the slow beginning and the reluctance of several people to participate actively. As the session progresses, even those with moderate dementia took part in the discussion and later produced floor plans for their dream studio. This was a challenging topic; it pushed the seniors to think about how creative activities are expressed and what elements they need on hand to make those activities happen. The video provides caregivers an opportunity to see how creative abilities can be expressed if seniors have a topic that engages their interest and the opportunity to pursue it creatively. If you would like to submit a review of the DVD, send it to our contact address and we will post the information here.